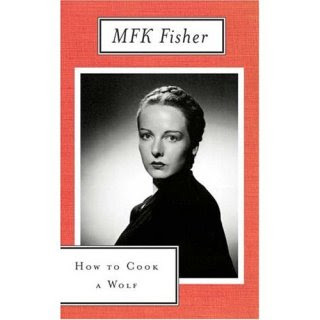 In particular, the chapter on meat (How to Carve the Wolf), Fisher describes her Prune Roast recipe, which other cooks have told her is "not wholly dependable: sometimes the prunes cook to bits; sometimes the sauce is too thin or too thick." And she concludes: "I have never found this to be true, but I do know that no recipe in the world is independent of the tides, the moon, the physical and emotional temperatures surrounding its performance." I'll have to remember it next time something I make comes out gross and barely edible, but I make my boyfriend eat it anyway.